Last week Courtney and I pitched the work of the "KIWIS" team to the Creative Media Production year two students. The purpose (of ours, and the other 3rd year pitches) was to recruit second year students to our team, as part of next semesters vertically-streamed classes. Our pitch was very well received, with everyone loving our characters 'Kori' and 'Moemoe'. I dedicated a significant part of our pitch to showcasing our models and rigs which our modeller Tom Zhang and our Rigger Kyle Phan put hours upon hours of work into. I'm really hoping the effort we've put into having these characters be both likeable and functional will be what draws new members to our team. Over the mid year break I'll be working on some of the set pieces in ZBrush, including Kori's tree-house! So expect to see a few WIP posts for those pop up. First post on the new website - I'm setting it up as a part of my 300 level portfolio class, but it's a long overdue part of my online presence and I'll be keeping it updated with all of my new work. I'm currently working on "Kiwi's Can Fly" as part of my 300 level classes. 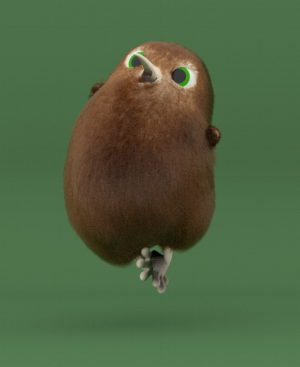 It's a series of simple animated shorts about a Kiwi named Kori who longs to fly. We're currently in pre-production, so mostly scripts and stuff - but we have some great looking development models which I'll share once they're completed. The show is being created for TVNZ's new kids platform HeiHei. I've set up some contact avenues on my about page, twitter, linkedin, artstation etc. so give that a look if you're trying to get in touch.